The Presentation is key part of Award Experience. The entire Service Recognition experience includes management acknowledging the employee's service milestone and their contributions, plus giving the awards packet containing an award certificate, and a gift of their choice. 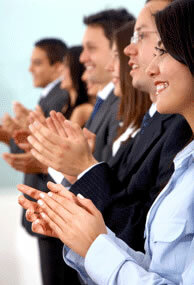 Always try to present Service Recognition Awards on, or close to the employee’s anniversary date. If possible, do it in front of their team, department, or the entire company. To get the most out of these award presentation ideas, be sure the the employee’s manager plays a key role. For the employee, the most meaningful recognition is from their manager. For some organizations, it may not be possible for managers to physically present service awards. In these situations, Award Packets can be mailed directly to remote employees. Do not miss this valuable opportunity to acknowledge and praise the employee’s accomplishments and special contributions, and tie these to your company’s goals and mission. After the individual employee recognition presentation, take advantage of this special opportunity to review some information about your company and its values. Talk about how your valued and loyal employees have helped make the company what it is today. If you have a newsletter, include a short article recognizing the employees who have received recent service recognition, and thank them again for their service. Note: Organizations should consider and respect the preferences of those employees who shy away from public recognition.